Construction began in July 2013 using "Bertha", at the time the world's largest-diameter tunnel boring machine. After several delays, tunnel boring was completed in April 2017, and the tunnel opened to traffic on February 4, 2019. The SR 99 Tunnel is a single tube that measures 9,270 feet (2,830 m) long and 52 feet (16 m) wide, carrying a double-decker highway that is 32 feet (9.8 m) wide and has two lanes in each direction. Each deck has two 11-foot (3.4 m) lanes, an 8-foot (2.4 m) west shoulder, and a 2-foot (0.61 m) east shoulder. The decks are designed with banks of two degrees in turns and four-degree grades to facilitate designed speeds of 50 miles per hour (80 km/h). Below the highway decks are utility lines and mechanical spaces for the tunnel's ventilation, lighting, and fire suppression systems. The tunnel has 15 emergency refuge areas located every 650 feet (200 m) with escape routes that lead to the north and south portals. Variable message signs and emergency phones are also located throughout the entire tunnel. The tunnel is monitored by over 300 security cameras that are fed into a WSDOT traffic control center in Shoreline that can dispatch incident response teams. In the event of a fire, a set of fiber optic cables in the ceiling would sense heat and activate sprinklers. A set of large fans located in the two portal operations buildings would then force smoke out through a set of 40-foot (12 m) ventilation shafts. The tunnel also has cell phone and FM radio service, with the latter able to overridden by WSDOT for emergency broadcasts. The tunnel begins south of Downtown Seattle in the SoDo neighborhood, adjacent to the Port of Seattle's container ship terminal and the city's two outdoor sports stadiums, CenturyLink Field and T-Mobile Park. SR 99 enters the tunnel after passing Royal Brougham Way and a future interchange with Alaskan Way at South Dearborn Street located adjacent to the south maintenance area and ventilation shaft. An additional set of ramps connect to South Royal Brougham Way and the East Frontage Road that terminates a block south at Atlantic Street. The tunnel carries two lanes of southbound traffic on its upper deck and two lanes of northbound traffic on its lower deck, and functions as a complete bypass of Downtown Seattle with no intermediate exits; it has a posted speed limit of 45 miles per hour (72 km/h). The tunnel travels northwesterly under Pioneer Square and Downtown Seattle, generally following 1st Avenue. It reaches its deepest point at Virginia Street, approximately 211 feet (64 m) below street level, and begins its turn north through parts of Belltown and the Denny Triangle. The tunnel emerges at a portal located west of Aurora Avenue and north of Harrison Street, adjacent to a tunnel operations building. SR 99 continues onto Aurora Avenue and crosses over Mercer Street, while an onramp allows access to the tunnel from 6th Avenue and an offramp carries tunnel traffic to Republican Street in South Lake Union. The SR 99 Tunnel is tolled and has a variable rate that ranges based on time of the day, number of vehicle axles, and payment method. Tolls are collected electronically, with a lower rate charged to Good to Go pass users and a higher rate for scanned plates that are sent a toll via mail. As of 2019[update], the toll rate for two-axle vehicles is set at $1.00 to $2.25 for Good to Go users and $3.00 to $4.25 for pay-by-mail users. Beginning in 2022, the toll rates will increase by three percent annually with approval from the state transportation commission. The Alaskan Way Viaduct is a double-decked elevated freeway that runs along Elliott Bay on the Downtown Seattle waterfront and, until January 11, 2019, when it was permanently closed, carried a section of State Route 99 (SR 99). It first opened to traffic on April 4, 1953, to provide a vehicular bypass of downtown for U.S. Route 99, the predecessor of SR 99; it connected with the Battery Street Tunnel, which opened the following year, and several downtown ramps that were completed years later. The viaduct and tunnel cost $18 million to construct (equivalent to $136 million in 2018 dollars) and severed the waterfront from the rest of downtown. The viaduct remained the primary north–south highway in Downtown Seattle until the construction of Interstate 5 (I-5) in the late 1960s. Weekday traffic volumes on the viaduct averaged around 110,000 vehicles per day in the mid-2000s, approximately half of equivalent sections on I-5. Calls to replace the viaduct and build a waterfront promenade surfaced as early as the late 1960s and early 1970s, increasing after the halted demolition of the Pike Place Market. 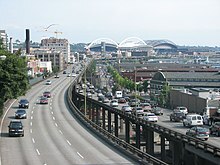 The viaduct runs above the surface street, Alaskan Way, from S. Nevada Street in the south to the entrance of Belltown's Battery Street Tunnel in the north, following previously existing railroad lines. The 1989 Loma Prieta earthquake destroyed the similarly designed Cypress Street Viaduct in Oakland, California with the loss of 42 lives. The 2001 Nisqually earthquake damaged the viaduct and its supporting Alaskan Way Seawall and required the Washington State Department of Transportation (WSDOT) to invest US$14.5 million in emergency repairs. Experts gave a 1-in-20 chance that the viaduct could be shut down by an earthquake within the following decade. After the Nisqually earthquake, the viaduct was closed twice a year for WSDOT to conduct inspections of the structure. Those inspections have discovered continuing settlement damage. In 2005, a group of researchers and faculty from the University of Washington urged political officials to close the viaduct within a two-year timeframe. The view beneath the viaduct in August 2008; opponents of a new viaduct argued that the enlarged replacement would put more of the waterfront in shadow. Several replacement proposals were developed. Many Seattle leaders, including then-Mayor Greg Nickels and state and city transportation officials, favored building a tunnel. Plans for a six-lane, "cut-and-cover" double-decker tunnel were developed. The tunnel was envisioned to solve not only the viaduct's traffic limitations and safety problems, but also to allow better uses for the waterfront real estate, including parks, housing, and retail developments. While future development of the Alaskan Way real estate corridor may provide tax revenue for the city, many state lawmakers objected to the cost of the proposed six-lane tunnel. One criticism compared the plan to Boston's Big Dig project, which was said to illustrate the schedule and budget challenges of a large cut-and-cover tunnel. Proponents responded that the Seattle proposal was significantly smaller in scale than the Big Dig. Another proposal aimed to replace the current viaduct with another elevated structure with updated seismic standards. This new viaduct would be larger, 12-foot (3.7 m) wide lanes with new shoulders on both sides, compared to the structure it would replace, which had no shoulders and lanes as narrow as 10 feet (3.0 m) in places. The on and off ramps at the northern and southern portion of the viaduct would remain the same with an additional full intersection at South Atlantic Street and South Royal Brougham Way. The First Avenue off ramp would be removed. The plan included a complete replacement of the sea wall. It was estimated to cost $2.8 billion and take 10–12 years to construct. Many prominent leaders and organizations opposed the elevated structure and believed this was a unique opportunity to remove the viaduct and connect downtown Seattle to the waterfront. Former Governors Dan Evans and Gary Locke, former U.S. Senator Slade Gorton, and the American Institute of Architects recommended against rebuilding the viaduct. WSDOT evaluated five proposals in 2003–2004 and decided that the six-lane cut-and-cover tunnel was the preferred alternative. Rebuilding the viaduct was retained as a backup plan. However, due to the costs and scope of the project, other options were still being discussed in the local media. A proposal to remove the viaduct and replace it with surface street and transit improvements was backed by former King County Executive Ron Sims, the People's Waterfront Coalition, and the Congress for the New Urbanism. Proponents of this plan offered examples of successes in removing highways in other cities. They envisioned the waterfront becoming a pedestrian-friendly neighborhood with a mix of commercial, retail, and public park spaces. Traffic needs would be addressed through modifications to existing streets, I-5, and public transit; they argued that these modifications would be desirable in any event. Proponents further argued that this plan had the potential to improve the tourist economy, create jobs, and encourage a denser and more residential downtown through the offering of a generous waterfront park. The total cost of removal of the viaduct, repairing the seawall, and improvements to I-5 and existing streets was unofficially estimated to be $1.6 billion. In 2006, Seattle City Council member Peter Steinbrueck noted, "While the mayor's first choice is the tunnel, he supports the City Council's resolution that designates a surface and transit alternative as a backup." In response to concerns about the cost of the originally proposed tunnel construction, the city council created a scaled-down, four-lane hybrid tunnel option. This would have combined the smaller tunnel with surface transit improvements to address traffic needs. The tunnel's 14-foot (4.3 m) shoulders would be used as an extra travel lane each way during periods of high demand. Transit service would be increased during peak commuter periods. Cars entering and exiting from Elliott and Western Avenues would each have a dedicated lane. Third Avenue would become a permanent transit corridor. The cost estimate for the four-lane tunnel was $3.4 billion. On February 13, 2007, Governor Christine Gregoire rejected the tunnel hybrid option, saying that a WSDOT review showed the tunnel proposal "does not meet state and federal safety standards." Of particular concern was that the use of shoulders as traffic lanes during peak traffic times would leave no additional lanes for emergency access. However, several of the viaduct "stakeholders committee" brought on board to advise the city indicated that the tunnel option should remain on the table. State and city officials deadlocked in late 2006 over whether to build an elevated structure (the state's preference) or a hybrid tunnel (the city's preference). Governor Gregoire stated "no action" was not an option for the viaduct. The state government called for an advisory ballot on March 13, 2007, for Seattle residents, which was supported by the city council. The advisory ballot allowed Seattleites to vote on whether they supported a surface-tunnel hybrid and whether they supported an elevated structure. Voters rejected both options, with the surface-tunnel hybrid getting only 30% support and the elevated structure only 43%. Mayor Mike McGinn, elected in 2009 and opposed to highway expansion, joined other tunnel opposition groups to refer city council-approved agreements about the tunnel to the voters as a citizen's referendum. The referendum was initially blocked by a lawsuit from the city, but was pared down to one aspect of the city's approval for the project and placed on the August 2011 ballot. Under the ruling, the referendum would only challenge one section of the original 140-page City Council ordinance that approved agreements over street use, utilities, design and liability for the tunnel following completion of the project's ongoing environmental review process. The referendum vote approved the City Council's actions by 58 percent on August 16, 2011. The Federal Highway Administration completed its analysis of the project's final EIS and issued its record of decision with WSDOT later that month, allowing pre-construction activities to begin. In January 2008, as debate on its replacement continued, Governor Gregoire announced that the State of Washington would take down the viaduct in 2012. On January 12, 2009, the state of Washington, King County, the city of Seattle, and the Port of Seattle revealed that they had agreed to replace the viaduct with a bored underground tunnel. On March 4, 2009, the state senate passed a bill endorsing the tunnel option. On May 12, 2009, Governor Gregoire signed Senate Bill 5768, authorizing $2.8 billion in state funds for a possible deep-bore tunnel. Disparate factions, ranging from some environmentalists to some industrialists, criticized the tunnel decision. A business owner argued that the restrictions on hazardous cargo through the tunnel would restrict movement of freight through downtown, though hazardous cargo is already prohibited from the Battery Street Tunnel and the viaduct at peak hours. Similarly, another argued that surface traffic would increase, which would cause further problems to downtown freight transport. A chairman of a local Sierra Club chapter argued that the large investment in automobile transport did not take into account global warming concerns. The city of Seattle will fund surface street improvements, utility relocation, and repairs to the Alaskan Way Seawall, which was also damaged in the 2001 Nisqually earthquake. Since the proposed tunnel will contain two lanes in each direction as opposed to the viaduct's three, and no Western Avenue exit to serve the Belltown, Interbay, Magnolia, and Ballard areas, King County will fund transit improvements to offset the loss. The Port of Seattle approved a $267.7 million contribution. $200 million will be collected from tolls at rates set by the Washington State Transportation Commission with input from the Advisory Committee on Tolling and Traffic Management. WSDOT began part of the larger project in 2008, while the replacement debate was still on-going, by repairing some of the viaduct columns. The $80 million tunnel boring machine (TBM) Bertha was created for this project by Hitachi Zosen Corporation near Osaka, Japan. The 326 ft (99 m), 6,700-short-ton (6,100 t) TBM was disassembled into 40 pieces and shipped to Seattle where it was reassembled in the launch pit near the south end of the future tunnel. From there, the record-breaking 57.5-foot (17.5 m) diameter borer moves in 6.5 ft (2.0 m) increments toward the north end. WSDOT nicknamed the TBM "Bertha" after Seattle's first female mayor, Bertha Knight Landes. This name was chosen from names submitted by kindergarten through 12th grade students for a naming competition. The initial phase of demolition and removal of the viaduct began on October 21, 2011, to prepare the southern portal. Only a southern portion of the viaduct was removed at that time; the viaduct along the central waterfront remained open for traffic until the tunnel was complete. Boring of the tunnel with "Bertha," at the time the world's largest-diameter tunnel-boring machine, began on July 30, 2013, and at the time was expected to be completed in 14 months. After three weeks of drilling, the project was estimated to be two weeks behind schedule; problems with fiberglass near the front of the drill and a labor dispute with a local longshoreman's union were blamed. Work was halted on December 6, 2013 after the machine overheated and shut down  approximately 1,083 feet (330 m) into the planned 9,270-foot-long (2,830 m) route. Investigations later revealed the seal system that protects the machine’s main bearing had been damaged. Three days prior to stopping, the machine mined through an 8-inch-steel well-casing used to help measure groundwater in 2002 around Alaskan Way, drilled as part of the planning phases of the project. Whether this pipe had anything to do with the machine’s failure is at the center of legal dispute between WSDOT and the contractor, Seattle Tunnel Partners. This delay lasted for more than two years as the workers had to dig a 120-foot (37 m) vertical shaft down to Bertha's cutting head to repair it. Settling was discovered in Pioneer Square that may be related to this additional excavation. Tunnel boring had resumed on December 22, 2015. The tunnel boring was halted 23 days later on January 14, 2016, after a 30-foot-wide (9.1 m) sinkhole developed on the ground in front of the machine, causing Governor Jay Inslee to halt drilling until the contractors can perform a root cause analysis to show that the machine can be run safely. Even though contractors filled the hole with 250 cubic yards (190 m3) of material, the ground above the tunnel-boring machine continued to sink, according to the Washington State Department of Transportation. The tunneling restriction was lifted on February 23, 2016, and tunneling resumed that day. Bertha passed under the Alaskan Way Viaduct in early May, closing the roadway for 11 days as the machine had 15 feet (4.6 m) of vertical clearance under the structure's pilings. On April 4, 2017, the tunnel boring machine broke through to the recovery pit on the north end of the tunnel, completing the excavation process. The boring machine was dismantled and removed from the site over the next four months. Dirt produced by tunnel construction was sent to fill a CalPortland quarry in nearby Port Ludlow. In July 2016, WSDOT estimated that the tunnel would be completed and open to traffic in early 2019. An estimated $223 million in cost overruns were reported as a result of the two-year stoppage. As of 2019, litigation is ongoing over which parties are responsible for the $642 million repair to the tunnel boring machine. Fragments of the steel well casing struck in December 2013 and cited as a possible cause of Bertha's breakdown were stored as evidence at the construction site and subsequently went missing in 2014. Detailed journal entries kept by the tunnel contractor's deputy project manager between December 2013 and February 2014 also went missing. The viaduct closed permanently on January 11, 2019. Seattle Tunnel Partners announced that work was substantially complete on the tunnel in October 2018. Following the closure of the viaduct, sections of SR 99 were closed to traffic for three weeks to allow for the excavation of buried tunnel ramps at the north and south portals, as well as other preparations. The closure was widely expected to cause increased traffic congestion, and local government agencies responded by implementing expanded transit service and making other transportation changes to accommodate the displaced drivers. Despite the predicted traffic congestion, commute times for the Seattle area were not significantly above average, with many commuters opting for public transit, telecommuting, or bicycling to work. On February 2, 2019, the downtown tunnel and sections of the viaduct and Battery Street Tunnel were opened to pedestrians as part of a community celebration and festival that was attended by 100,000 people. The celebrations included an 8K run, temporary art exhibits, food trucks, street performances, interactive exhibits, and an official ribbon-cutting ceremony. The following day, a bicycle race was held on the viaduct and in the new tunnel, with 12,000 participants. The state government also spent $4.4 million on billboards and advertisements on television and buses to market the new tunnel. The tunnel opened to northbound vehicular traffic at 11 p.m. on February 3 and southbound traffic at 12:15 a.m. on February 4. Other ramps and roads associated with the tunnel project, including an extension of Alaskan Way to Terminal 46 and the Harrison Street crossing were opened; the lone exception was the northbound offramp from SR 99 to Dearborn Street, which opened on February 19. The first full day of tunnel operations saw lower traffic volumes, with only 22,145 vehicle trips, due to an ongoing snowstorm, as well as confusion at the left-side exits. Within days, reports of smoke and haze within the tunnel prompted WSDOT to investigate possible faults in the exhaust ventilation system. Within months of opening, tunnel usage had increased to over 70,000 trips per weekday and a weekly volume just under 500,000 trips by late March 2019. Tolls are being waived for the first few months of operations. WSDOT plans to fill in the Battery Street Tunnel, because the 1952 cut-and-cover tunnel does not meet modern safety standards, is expensive to maintain, and will be made redundant by the Alaskan Way tunnel. ^ a b Esser, Doug (July 31, 2013). "Bertha takes first bite of new Seattle tunnel". KOMO. Archived from the original on August 3, 2013. Retrieved July 31, 2013. ^ "Tunneling toward a new SR 99; The SR 99 tunnel route (map)". Washington State Department of Transportation. Archived from the original on December 10, 2012. Retrieved December 8, 2012. ^ "Follow Bertha". Washington State Department of Transportation. Retrieved December 25, 2018. ^ Porterfield, Elaine (May 2017). "Tunnel Vision: A 360 Look at Bertha Underground". Seattle Magazine. Retrieved December 25, 2018. ^ "Tunneling into the numbers" (PDF). Washington State Department of Transportation. May 2017. Retrieved December 30, 2018. ^ a b Lindblom, Mike; Baruchman, Michelle (January 31, 2019). "Highway 99 tunnel opens next week. Here are answers to your questions about the project". The Seattle Times. Retrieved January 31, 2019. ^ a b c d Lindblom, Mike (November 19, 2018). "When does the viaduct close? How much is the tunnel toll? Your guide to Seattle's Highway 99 project". The Seattle Times. Retrieved December 25, 2018. ^ a b c Lindblom, Mike (April 16, 2017). "Inside the Highway 99 tunnel: Bertha's done digging, but the roadway work rolls on". The Seattle Times. p. B1. Retrieved December 25, 2018. ^ a b "Seattle's new SR 99 tunnel". Washington State Department of Transportation. Retrieved December 25, 2018. ^ "Life after Bertha: Focus shifts from mining to other tunnel work". Washington State Department of Transportation. April 4, 2017. Retrieved December 25, 2018. ^ a b Martin, Casey (January 30, 2019). "Here's why it's safe to drive through the new tunnel". KUOW. Retrieved January 31, 2019. ^ Minnick, Benjamin (March 28, 2018). "A trip inside our new 'smart' tunnel". Seattle Daily Journal of Commerce. Retrieved December 25, 2018. ^ Schlosser, Kurt (August 31, 2018). "Seattle tunnel's high-tech ventilation system designed to keep air fresh deep below ground". GeekWire. Retrieved December 25, 2018. ^ a b c "Traveling on the new SR 99 corridor" (PDF). Washington State Department of Transportation. January 2017. Retrieved December 25, 2018. ^ "Tunneling toward a new SR 99 corridor" (PDF). Washington State Department of Transportation. July 2016. Retrieved December 25, 2018. ^ Lindblom, Mike (April 18, 2018). "Highway 99 tunnel tolls could range from $1 to $2.25, depending on time of day". The Seattle Times. Retrieved December 25, 2018. ^ "SR 99 Tunnel Toll Rates". Washington State Department of Transportation. Retrieved December 25, 2018. ^ "SR 99 tunnel toll rates will range from $1 to $2.25 in Seattle". KING 5 News. October 16, 2018. Retrieved December 25, 2018. ^ "SR 99 Tunnel Toll Rate Setting". Washington State Transportation Commission. October 2018. Retrieved February 9, 2019. ^ a b Lange, Larry (March 9, 2007). "Would a new viaduct be 'bigger and uglier'?". Seattle Post-Intelligencer. p. B1. Retrieved December 26, 2018. ^ "State of Washington, Department of Transportation (WSDOT), Alaskan Way Viaduct, Seattle, WA (1950-1959)". Pacific Coast Architecture Database. Retrieved December 25, 2018. ^ Diltz, Colin (November 22, 2018). "Seattle has changed: See the Alaskan Way Viaduct under construction in the 1950s". The Seattle Times. p. A1. Retrieved December 25, 2018. ^ Ott, Jennifer (December 19, 2011). "Alaskan Way Viaduct, Part 4: Replacing the Viaduct". HistoryLink. Retrieved December 26, 2018. ^ "Is most of the traffic using the viaduct today going to downtown or through downtown?". WSDOT. Archived from the original on April 27, 2013. Retrieved December 8, 2012. ^ "Cypress Viaduct Freeway". Archived from the original on July 7, 2009. ^ Anderson, Ross (April 7, 2002). "Dutiful Servant, Brutal Barrier: The Viaduct at a Crossroads". Pacific Northwest. The Seattle Times. Archived from the original on March 4, 2016. Retrieved December 8, 2012. ^ "Viaduct Inspections". Washington State Department of Transportation. 2018. Archived from the original on September 6, 2018. Retrieved October 11, 2018. ^ Miles, Scott; Montgomery, David R.; Beyers, Bill (March 2, 2006). "Shut down the viaduct". The Seattle Times. Archived from the original on October 8, 2012. Retrieved December 8, 2012. ^ Barnett, Erica C. (February 22, 2007). "No and Hell No". The Stranger. Archived from the original on September 19, 2008. Retrieved November 25, 2008. ^ Howland, Jr, Greg (April 19, 2006). "Seattle's Little Dig". Seattle Weekly. Archived from the original on September 12, 2015. Retrieved December 8, 2012. ^ "WSDOT Viaduct Alternatives Information". WSDOT. Archived from the original on October 26, 2006. ^ Gilmore, Susan (December 12, 2006). "Opposition to viaduct addressed to Gregoire". Seattle Times. Archived from the original on October 12, 2018. Retrieved October 11, 2018. ^ Bennett, Sam (January 14, 2009). "Tunnel to replace Alaskan Way Viaduct in Seattle". Portland, OR: Daily Journal of Commerce – via Newspaper Source Plus. ^ "Appendix B: Alternatives Description and Construction Methods". Alaskan Way Viaduct Replacement Project: Final Environmental Impact Statement (PDF). WSDOT. July 2011. Archived (PDF) from the original on July 10, 2014. Retrieved December 11, 2012. ^ "Gregoire nixes surface option for viaduct". KOMONews.com. AP. February 19, 2007. Archived from the original on March 4, 2016. Retrieved December 7, 2012. ^ a b "Seattle's Alaskan Way Viaduct". Congress for the New Urbanism. Archived from the original on January 7, 2013. Retrieved December 8, 2012. ^ Holden, Dominic (March 16, 2011). "Stop the Insanity". The Stranger. Archived from the original on July 28, 2013. Retrieved August 1, 2013. ^ Steinbrueck, Peter (October 10, 2006). "Climate's Right For Fresh Viaduct Plan". The Seattle Times. Archived from the original on August 26, 2012. Retrieved December 8, 2012. ^ Garber, Andrew; Young, Bob; Gilmore, Susan (January 17, 2007). "Nickels' backing for 4-lane "tunnel lite" gets cool reception". The Seattle Times. Retrieved February 7, 2019. ^ Garber, Andrew; Gilmore, Susan; Lindblom, Mike (February 14, 2007). "State says no tunnel; mayor still wants vote". The Seattle Times. Archived from the original on February 2, 2013. ^ Garber, Andrew; Lindblom, Mike; Heffter, Emily (January 12, 2009). "City, county, state agree on tunnel to replace viaduct". The Seattle Times. Archived from the original on October 13, 2012. ^ McGann, Chris; Santos, Melissa; Lange, Larry (January 17, 2007). "Tunnel option off table for viaduct replacement". Seattle Post-Intelligencer. Archived from the original on October 15, 2012. Retrieved December 8, 2012. ^ Young, Bob (March 7, 2007). "Viaduct vote set; state may ignore it". The Seattle Times. Archived from the original on July 6, 2008. ^ "King County Election Results (Mar. 13 special election)". King County. March 27, 2007. Archived from the original on August 23, 2012. Retrieved December 8, 2012. ^ Yardley, William (August 19, 2011). "Seattle, After Decade of Debate, Approves Tunnel". The New York Times. p. A13. Retrieved December 23, 2018. ^ Thompson, Lynn; Lindblom, Mike (May 21, 2011). "Judge: Anti-tunnel measure going on August ballot". The Seattle Times. p. A1. Retrieved February 4, 2019. ^ "Referendum 1 (August 2011)". King County Elections. Retrieved February 4, 2019. ^ "Voters backing Seattle tunnel; fight may finally be over". The Seattle Times. August 17, 2011. p. A1. Retrieved February 4, 2019. ^ Gutierrez, Scott (August 23, 2011). "SR 99 deep bore tunnel gets federal approval". Seattle Post-Intelligencer. Retrieved December 23, 2018. ^ McGann, Chris (January 3, 2008). "Gregoire: 'Watch me' tear down the viaduct". Seattle Post-Intelligencer. Archived from the original on October 15, 2012. Retrieved December 8, 2012. ^ a b c d e Garber, Andrew (January 13, 2009). "Tunnel in place of viaduct: A deal, but how to pay?". The Seattle Times. Archived from the original on January 15, 2009. ^ Garber, Andrew (March 4, 2009). "Senate passes bill to replace viaduct with tunnel". The Seattle Times. Archived from the original on November 12, 2010. Retrieved March 5, 2009. ^ a b c d e Lindblom, Mike; Sara Jean Green (January 13, 2009). "Gregoire announces tunnel plans; car-tab taxes might help pay for it". The Seattle Times. Archived from the original on January 15, 2009. ^ "Alaskan Way Viaduct: Will there be restrictions on freight using the tunnel?". wa.gov. Archived from the original on September 12, 2015. Retrieved August 3, 2015. ^ a b c "Alaskan Way Viaduct: Budget". WSDOT. Retrieved February 5, 2019. ^ "Will tolling cause diversion?". WSDOT. Archived from the original on July 12, 2014. Retrieved December 26, 2013. ^ "Advisory Committee on Tolling and Traffic Management (2011–present)". WSDOT. Archived from the original on February 14, 2014. Retrieved December 26, 2013. ^ Seattle Tunnel Partners (December 1, 2015). "Seattle Tunnel Partners monthly schedule: November 2015" (PDF). Washington State Department of Transportation. Archived (PDF) from the original on December 28, 2015. Retrieved December 27, 2015. ^ Robinson, Patrick (September 7, 2012). Seattle Deep Bore Tunnel Tour Sept. 6, 2012. West Seattle Herald. Archived from the original on April 25, 2016. Retrieved December 1, 2016. ^ Newcomb, Tim (August 30, 2012). "Digging an Enormous Tunnel Under Downtown Seattle". Popular Mechanics. Archived from the original on November 5, 2012. Retrieved December 9, 2012. ^ Johnson, Kirk (December 4, 2012). "Engineering Projects Will Transform Seattle, All Along the Waterfront". The New York Times. Archived from the original on November 9, 2016. Retrieved February 26, 2017. ^ "SR 99 tunneling machine tweets her name: Bertha". WSDOT. Archived from the original on November 10, 2014. Retrieved December 10, 2012. ^ Gutierrez, Scott (October 22, 2011). "Alaskan Way Viaduct closure, demolition begin". Seattle Post-Intelligencer. Archived from the original on November 17, 2011. Retrieved July 16, 2012. ^ "When will the viaduct be demolished?". WSDOT. Archived from the original on April 17, 2015. Retrieved December 10, 2014. ^ Yerkan, KaDeena (July 30, 2013). "Bertha starts digging: tunneling underway in Seattle" (Press release). Washington State Department of Transportation. Archived from the original on December 8, 2015. Retrieved December 5, 2015. ^ Lindblom, Mike (July 30, 2013). "Bertha's excavation mission beginning under downtown". The Seattle Times. Archived from the original on December 15, 2015. Retrieved December 5, 2015. ^ Lindblom, Mike (August 27, 2013). "Huge tunneling machine off to painfully slow start". The Seattle Times. Archived from the original on December 28, 2013. ^ Lindblom, Mike (August 19, 2017). "Insurance lawyers' new findings increase arguments in case of Bertha machine breakdown". The Seattle Times. Archived from the original on August 19, 2017. Retrieved August 19, 2017. ^ Lindblom, Mike (January 3, 2014). "What's blocking Bertha: a long steel pipe". The Seattle Times. Archived from the original on January 4, 2014. Retrieved January 4, 2014. ^ Lindblom, Mike (February 7, 2014). "Bad news: Bertha is damaged". The Seattle Times. Archived from the original on March 24, 2015. Retrieved February 7, 2014. ^ Johnson, Kirk (December 9, 2014). "In Seattle, a Sinking Feeling About a Troubled Tunnel". The New York Times. Archived from the original on March 14, 2016. Retrieved February 26, 2017. ^ Newborn, Laura (December 22, 2015). "Bertha tunnels into next phase of testing" (Press release). Washington State Department of Transportation. Archived from the original on December 27, 2015. Retrieved December 27, 2015. ^ Lindblom, Mike (December 22, 2015). "Bertha back on the move after 2 years of delays". The Seattle Times. Archived from the original on January 5, 2016. Retrieved December 27, 2015. ^ Lindblom, Mike (January 14, 2016). "Inslee orders tunnel dig halted as soil sinks above Bertha". The Seattle Times. Archived from the original on February 6, 2016. Retrieved January 15, 2016. ^ "Feb. 23 project update: Seattle Tunnel Partners resumes mining". February 23, 2016. Archived from the original on February 23, 2016. Retrieved February 23, 2016. ^ Demay, Daniel (May 11, 2016). "Viaduct closure ends, Bertha to make pit stop". Seattle Post-Intelligencer. Archived from the original on July 14, 2016. Retrieved July 20, 2016. ^ Lindblom, Mike (April 4, 2017). "Bertha's breakthrough just 'halftime' for tunnel project". The Seattle Times. Archived from the original on April 4, 2017. Retrieved April 4, 2017. ^ "Alaskan Way Viaduct - Goodbye Bertha: Final piece of the tunneling machine removed from tunnel". wsdot.wa.gov. WSDOT. Archived from the original on December 15, 2017. Retrieved December 15, 2017. ^ "Where will the dirt from tunneling go?". WSDOT. Archived from the original on December 19, 2013. Retrieved December 26, 2013. ^ Lindblom, Mike (July 21, 2016). "Bertha's woes grind on: more delay, higher cost for Highway 99 tunnel". The Seattle Times. Archived from the original on July 22, 2016. Retrieved July 21, 2016. ^ a b Johnson, Graham (January 9, 2019). "Dispute over missing evidence in Bertha breakdown goes to court". Kiro7. Retrieved February 23, 2019. ^ Mikkelsen, Drew (January 9, 2019). "Missing evidence questioned in trial over Seattle tunnel boring machine breakdown". Retrieved February 23, 2019. ^ a b Johnson, Graham (December 14, 2018). "Pipe pieces at center of Bertha breakdown lawsuit are missing". Kiro7. Retrieved February 23, 2019. ^ Lindblom, Mike (September 17, 2018). "Permanent closure of Alaskan Way Viaduct delayed until January". The Seattle Times. Archived from the original on September 17, 2018. Retrieved September 18, 2018. ^ "Seattle tunnel opening celebration set for February 2-3". KING 5 News. November 1, 2018. Retrieved November 1, 2018. ^ Gutman, David (January 24, 2019). "'The cars just disappeared': What happened to the 90,000 cars a day the viaduct carried before it closed?". The Seattle Times. Retrieved February 2, 2019. ^ Gutman, David (February 2, 2019). "'A huge achievement': Pedestrians swarm Seattle as viaduct comes down, tunnel set to open". The Seattle Times. Retrieved February 2, 2019. ^ Guevara, Natalie; Martin, Genna (February 2, 2019). "Making history: Thousands gather to celebrate opening of new SR-99 tunnel". Seattle Post-Intelligencer. Retrieved February 2, 2019. ^ Sundell, Allison (February 2, 2019). "Thousands celebrate Seattle tunnel opening with weekend festivities". KING 5 News. Retrieved February 4, 2019. ^ Lindblom, Mike (January 24, 2019). "Washington state spending $4.4 million to market the Highway 99 tunnel". The Seattle Times. Retrieved March 3, 2019. ^ Sundell, Allison (February 4, 2019). "Seattle tunnel open to traffic both directions". KING 5 News. Retrieved February 4, 2019. ^ "SR 99 tunnel now open to traffic". Washington State Department of Transportation. February 4, 2019. Retrieved February 4, 2019. ^ Lindblom, Mike (February 18, 2019). "Highway 99's northbound offramp in Sodo opens Tuesday morning". The Seattle Times. Retrieved February 18, 2019. ^ Lindblom, Mike (February 4, 2019). "Low traffic means an easy launch of the Highway 99 tunnel under Seattle". The Seattle Times. Retrieved February 4, 2019. ^ "Over 22,000 trips taken through Seattle's SR 99 tunnel on opening day". KING 5 News. February 6, 2019. Retrieved February 6, 2019. ^ Johnson, Graham (February 6, 2019). "WSDOT looking at systems in new SR 99 tunnel after smoke, haze". KIRO 7 News. Retrieved February 6, 2019. ^ Newborn, Laura (April 5, 2019). "How's traffic in Seattle's SR 99 tunnel?". WSDOT Blog. WSDOT. Retrieved April 7, 2019. ^ "State Route 99 tunnel toll-free for first few months". KING 5 News. January 30, 2019. Retrieved February 2, 2019. ^ "What will happen to the Battery Street Tunnel?". WSDOT. Archived from the original on December 19, 2013. Retrieved December 26, 2013. Gilmore, Susan (September 8, 2006). "Two views of the viaduct". The Seattle Times. Archived from the original on December 4, 2008. Gilmore, Susan (August 9, 2006). "State offers 3 decidedly different designs for viaduct". The Seattle Times. Archived from the original on December 4, 2008. Gilmore, Susan (August 2, 2006). "Idea of fixing viaduct seen as having merit but problems as well". The Seattle Times. Archived from the original on August 14, 2009. Gilmore, Susan (July 25, 2006). "What will happen if viaduct closes? Study takes a look". The Seattle Times. Archived from the original on August 14, 2009. Lange, Larry (May 3, 2006). "A Longer shelf life for the viaduct". Seattle Post-Intelligencer. Engineering view into the Earth-pressure-balanced TBM and Seattle-specific tunnel engineering issues, ITA AITES, June 2012.